Last September, Jill Colombo started The Grain Exchange out of the kitchen in her Doylestown-area house. Since then, her homemade gluten-free sweets have made their way into many Bucks County retail outlets. Jill, who herself can't consume gluten, bakes an array of cookies, brownies, cakes and other goodies. The staff here at Gluten Free Philly had a chance to try her brownies, Oatmeal Caramel Delights and three different cookies: Chocolate Peanut Butter Chip, Sugar, and Chocolate Chocolate Chip. These cookies are made with a blend comprised of white rice flour, potato starch, tapioca starch and xanthan gum. While we enjoyed all of the treats, the most popular of the bunch were the chewy peanut-butter chip cookies and the moist, gooey oatmeal bars. 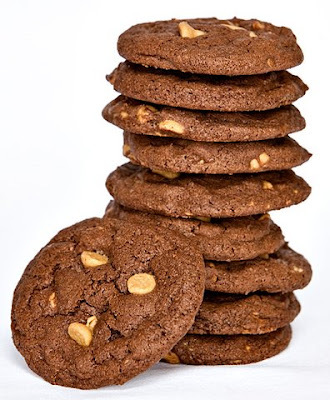 The Grain Exchange's brownies and several cookie varieties are available at the Town Crier Bakery in Lahaska, in Doylestown at Café Alessio, Saxby’s Coffee and Maximuck’s Farm Stand, in Plumsteadville at Chubby’s Dairy Barn, the Waterfall Café in Warrington, Kimberton Whole Foods and all three Jules Thin Crust Pizza locations (in Doylestown, Jenkintown and Newtown). During the month of May, some of Jill's baked goods will be sold at the Bucks County Designer House at Fieldstone Farm in Furlong. Her products, including cheesecakes and custom-made birthday and special event cakes, also can be ordered by calling 267-935-9244. Not related to this post, but do you know what company makes the hot dog buns at the Phillies Stadium? I'm trying to find out ingredients because of other allergens. I don't know who makes the buns. I suggest calling Aramark. The company's main number is 1-800-ARAMARK. You'll probably have to speak with a few people to get the info.